Chateau / Country House53819 sq. ft.
House w / 2 suites, 4 bedrooms, 2 living rooms, barbecue, swimming pool. We rent by day for corporate parties, birthdays, weddings and events with rates for 50, 100 or up to 250 people. We have special packages for extended holidays, Christmas, New Year's Eve and Carnival with different values. We also rent for family weekend with house for up to 30 people, including 2 suites, 4 bedrooms, 2 bathrooms, kitchen, 2 rooms and balcony. Barbecue area with 2 bathrooms and swimming pool 5 x 10 m adult and 3 x 3 m child with slide and separate hydromassage with waterfall, 2 changing rooms and laundry. Dead end street parking 50 cars. sitio top, a jacuze em especial é show!! as acomodações muito bem divididas e com muito conforto. a caseira é gente boa e o dono é nota 10 deixou até umas cervejas no freezer pra gente rsrsrs..
Ótimo local , boa infra estrutura e suporte. Recomendado. Lugar lindo, confortável, super recomendo. Local muito próximo da Rodovia Castelo Branco, pequeno trecho de terra. 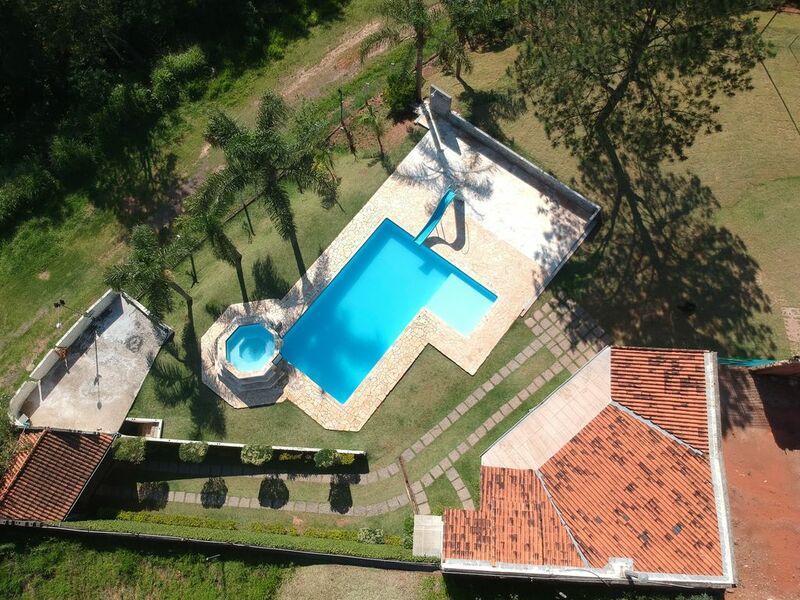 Ampla, confortável, plana, lugar lindo, proprietário muito atencioso, super indico. Fomos muito bem recepcionados, a casa estava toda organizada e limpa. O sítio é muito gostoso e aconchegante!! Nossa família e amigos adoraram.